Shabbat Morning Everything Bagel Strata — Nourish Co. When we host friends and family for Shabbat dinner on Friday night, we always have leftover challah. 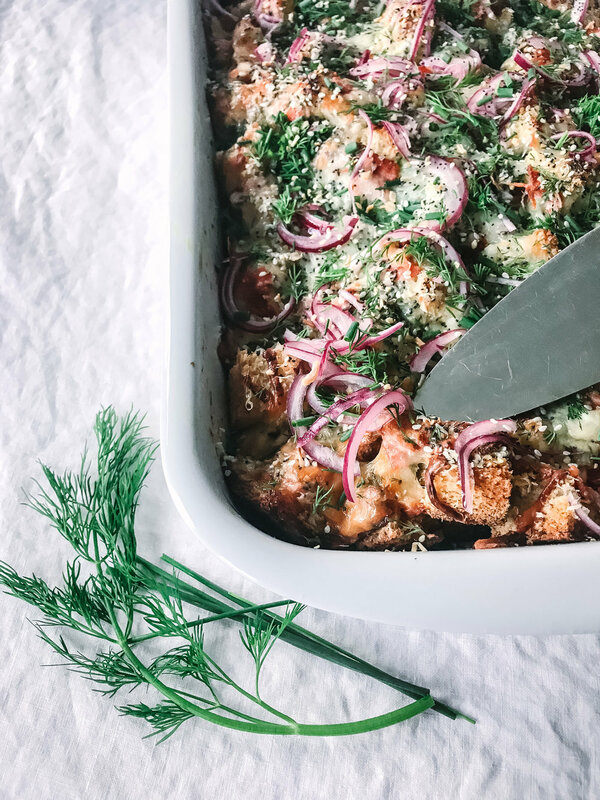 Since I don’t like sweet breakfast, I’ve devised this everything bagel savory challah strata with lox for Shabbat mornings instead. The following morning, I’d wake up to my sweet husband clinking around the kitchen making us French toast with the leftover challah. Bryan doesn’t cook, and so it took everything in me to finally tell him one day that I don’t really like French toast. Having grown up in a Japanese American household with a Japanese mother who loved to cook, every meal (including breakfast!) was savory. To this day, I need something savory in the morning. So I began brainstorming a savory dish that would incorporate day old challah. What I came up with is essentially a savory French toast with everything bagel and lox ingredients mixed in. Use around the same volume of cheese as milk. For the pickled red onion: Thinly slice 1/4 of a red onion. Place it in a bowl with 1/2 teaspoon salt, 1 tablespoon of honey and 1/2 cup vinegar (white wine, rice and apple cider all work- anything light in color). Let it pickle while you prepare the rest of the strata. Butter the baking dish and set the oven to 350°. Fill the baking dish with the cubed challah. Place milk and eggs in a large mixing bowl and whisk until well incorporated. Add mozzarella cheese, reserving a handful for later. Add lox, green onions, and chopped dill, reserving a handful for later. Sprinkle in salt and pepper. Stir again. Pour this mixture evenly over the cubed challah. You may need to push the challah down into the liquid to make sure most of the pieces are soaked through. Fluff it back up so the top layer looks nice and there are no holes where the challah was pushed down. Cover the strata in foil and bake for 20 minutes. Remove the foil and sprinkle the strata with remaining mozzarella, grated parmesan cheese, and everything bagel mix. Bake for another 20 minutes. Check on it often to make sure the cheese isn’t burning (it should be golden brown). To test for doneness, remove the pan from the oven and give it a shake- if it doesn’t jiggle, it’s done. Sprinkle with remaining dill and pickled red onions. Let it rest for five minutes and serve while warm. You can prepare everything up until step 8 the night before. Simply remove it from the fridge 30 minutes before baking. For another idea on what to do with day old challah bread, check out kabocha pumpkin soup with challah croutons. For the FREE Modern Shabbat Toolkit, I created after years of trial and error, head here. I hope this helps you make Shabbat a little easier and full of connection with the people you love most.